You can re-use the artefacts that you collected in as many pages as you wish. On the landing page of Portfolio, you can do the following. Click the Copy button to choose an existing page or collection of yours or from another user as basis for a new portfolio. 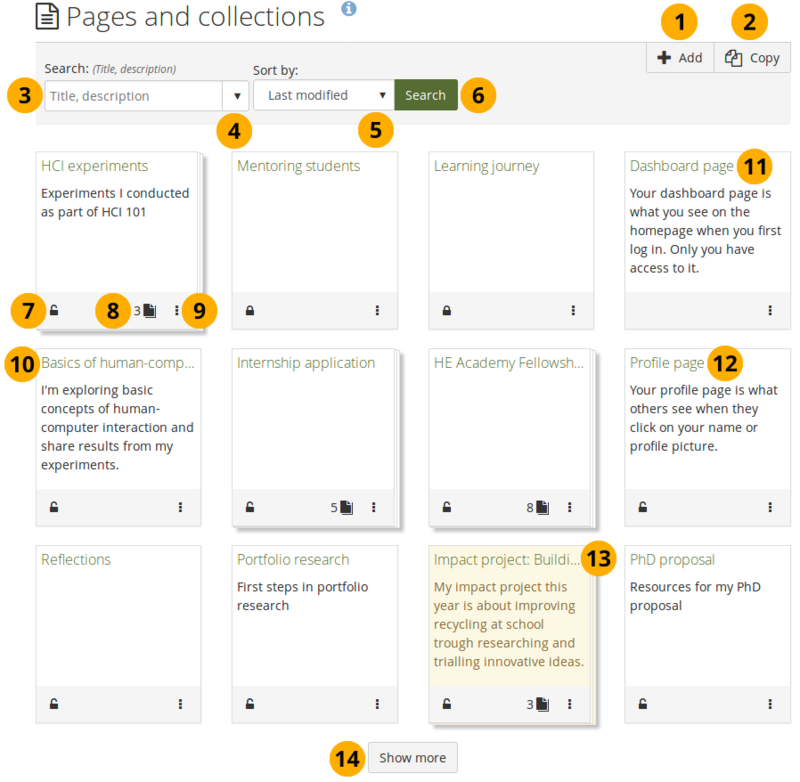 Title, description, tags: Search for your search term in the title, descirption, and tags of your portfolios. Title, description: This is the default option. It searches in the title and description of your portfolios. Tags: Search only within the tags of your portfolios. If you select to search only tags, you see an additional option to search for multiple tags and match on all of them. 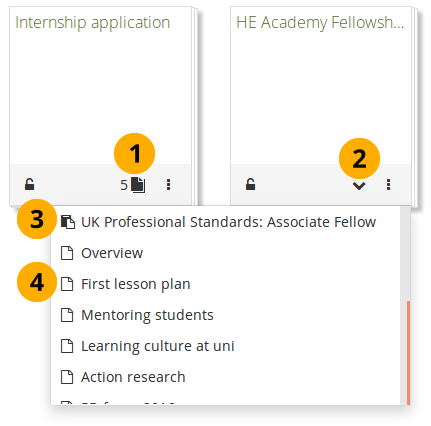 The search option and the sort order that you choose do not change when you navigate away from the overview page or log out. When you change either setting, that new one will be used until you change it again. Click the Search button to search your portfolios based on your search term and / or sorting criteria. Click the Locked icon or the Unlocked icon to manage the access to your portfolio. Collections display the number of pages that they contain. Click the More options icon to reach more options for the page or collection. If you are on a computer, you can hover over the title of a portfolio and see it in its full length if it needed to be shortened. 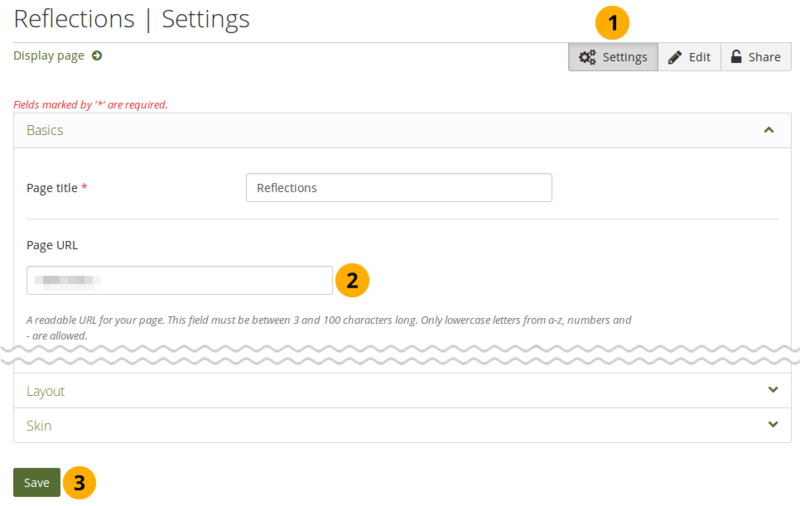 Dashboard page: Click the More options icon to make changes to your dashboard page. You cannot delete your dashboard page though. Profile page: Click the More options icon to make changes to your profile page. You cannot delete your profile page, but you can decide on different sharing options. When you submitted a portfolio to a group, you cannot change a great number of the page’s content or delete it until the page is released again. It is displayed with a different colored background to differentiate it quickly from non-submitted portfolios. Click the Show more button to display more portfolios. The page and collection information boxes display a number of icons, which are described in more detail here. If you have not yet shared your portfolio with somebody else, you see the Locked icon . Click the Locked icon to start sharing your portfolio. The icon turns into a downwards facing menu chevron . A drop-down menu opens. Click the Manage access option to share your portfolio with others on the site. You are taken to the Edit access screen where you can choose with whom to share your portfolio. Click the Manage secret URLs option to create a secret URL for your portfolio. You are taken to the Secret URLs screen where you can set up one or more secret URLs. If you already shared your portfolio with others, you see the Unlocked icon . Click the Unlocked icon to see with whom you have already shared your portfolio. Click the Manage access option to edit the existing sharing settings for your portfolio. You are taken to the Edit access screen where you can choose with whom to share your portfolio. Click the Manage secret URLs option to create or edit a secret URL for your portfolio. You are taken to the Secret URLs screen where you can set up one or more secret URLs. Friends: If you shared your portfolio with all your friends. Registered users: If you gave all people with an account on your Mahara instance access to your portfolio. Public: If you made your portfolio available to everyone on the internet. Name of a person: If you shared your portfolio with a specific person. Group name (Submitted): If you submitted this portfolio to a group. Group name (Admin / Members / Tutors): If you shared your portfolio with only a certain type of group members in that group. Group name: If you shared your portfolio with an entire group. Institution name: If you shared your portfolio with all people in your institution. Secret URL: If you set up a secret URL for your portfolio. The drop-down menu has a scrollbar so you can view all people or groups of people with whom you shared your portfolio. Start or end dates or whether copying is allowed are not displayed in the drop-down menu. You need to go to the Share screen to see that additional information. You can view how many pages are part of a collection and what their titles are by clicking the Pages icon . Click the Pages icon . 0-2: One sheet of paper. 3-10: Two stacked sheets of paper. 11 or more: Three stacked sheets of paper. If you have a SmartEvidence collection, you see that listed first with the SmartEvidence page icon . All other pages are are listed with the Single page icon . Click the page you want to view. You can find additional options for pages or collections via the More options icon . Click the More options icon to see additional editing options. If you view the options for a collection, click Manage to add or remove pages from your collection. Click Edit to edit the general information of a page or collection such as title, description, and tags. Click Delete to delete the page or delete the collection. 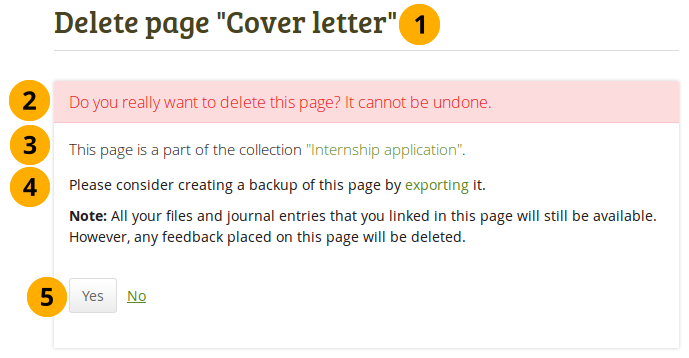 If you delete a collection, the pages and artefacts within it are not deleted. Created: The date and time when you set up the page or collection. Modified: The last time you made a change to the page or collection. If you submitted a portfolio, you cannot edit or delete the page or collection until it has been released. Therefore, you don’t see those options anymore. 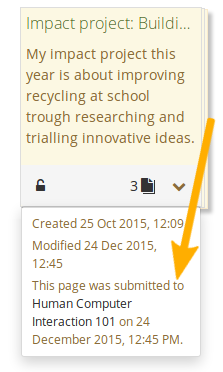 However, you see when you submitted the portfolio to which group. 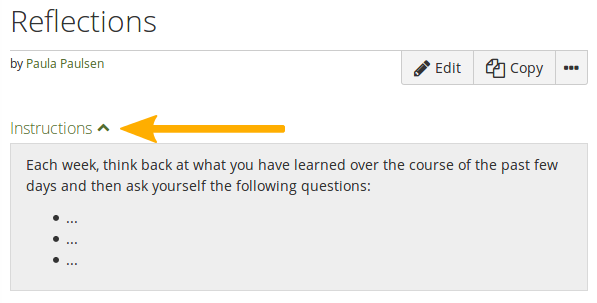 Your profile page is visible to other users on Mahara by default. If your administrator allowed it, you can also make it visible to everybody on the Internet. In certain circumstances, the site administrator may have allowed restricting access to your profile page to institution members only. In that case, you are able to remove the access for everybody who has an account on Mahara. When other people have access to your profile page, they can perform a number of actions or get in touch with you, depending on their permissions. Your display name and profile picture. An institution or site administrator can click the Log in as [username] button and masquerade as you. An institution or site administrator can view your basic account settings and make changes if needed by clicking the Account settings button. If you allowed others to contact you, they can see the Send message button. If you allowed friend requests, people can click the Request friendship button. Alternatively, if you automatically approve new friends, they see the Add to friends button. And if they don’t want to be your friend any longer, they can click the Remove from friends button. If the person viewing your profile is a group administrator, they can invite you to one of their groups. If the person viewing your profile is a group administrator of a controlled group, they can add you to the group immediately. If you are a member of an institution, the institution name is stated and linked to the institution’s contact page. Your entire profile page is visible. If you do not see the full profile of a person, but just “Full access to this profile is restricted”, then you can only perform a few options for this person. We advise you not to use your profile page as your portfolio because you cannot control who can look at the information you make available on your profile. 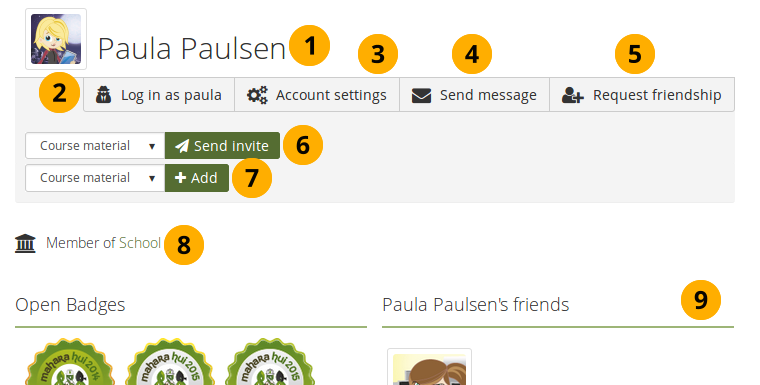 At minimum it is everybody in your institution or who has an account on Mahara. At maximum it can be everybody online. Always remember to think about your own personal security before releasing contact information on a publicly available page or even just for other Mahara users. Once you have made your profile page or any portfolio page public, Google and other search engines can index and cache it. Even if you take the public access away at some point, the cached version may still be available online. Pages that are made available via a secret URL are not found by search engines unless you link to them from another page. Use regular pages to create your portfolio and your profile page as a business card or brief introduction to you without disclosing lots of details. You can edit your profile page like any other page. You can find more information about editing a page in the page editor. You add a new page in your portfolio when you want to display artefacts together, e.g. for presenting them to others, for showing your progress in a project etc. On the Pages and collections page, click the Add button. In the modal that comes up, click the Page button. You are taken to the Settings. If you cannot see these settings options, click the icon to make them visible. Page title: Provide a title for your page. This field cannot be left empty. If you do not enter a title, the default “Untitled” will appear. Page description: Write a brief description summarising your objective of this page. It will appear on the page itself. 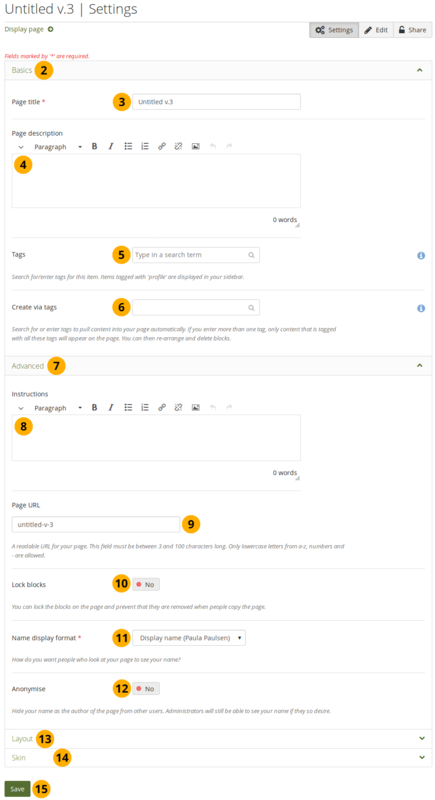 Tags: Enter tags to find your page more easily at a later stage. You can choose from your existing tags by starting to type a letter and then selecting the tag you want to use. You can also type a new tag, select it, and it is added to your list of tags. You can find more information on how to use the tag selector in the “Tags” section. Create via tags: You can select one or more tags to populate the page with all artefacts and blocks that have been tagged with them. If you select more than one tag, you only see content that matches all selected tags, i.e. it must match tag one and tag two. The page is only populated with already existing tagged content. If you tag new artefacts, they will not be added automatically. You will have to add them manually or populate the page again. Only new artefacts will be added. Page instructions: Write your instructions for setting up the page in the editor to scaffold the portfolio creation. The instructions are displayed in both edit and view mode of the page where you can collapse them if you don’t need them. Page URL: Choose the name for your page if you do not like the default one. It must be 3-30 characters long. You can only use lowercase letters from a-z, numbers and - (hyphen). If you are just setting up your page, the default URL “untitled v.2” (or similar) is displayed. As soon as you save the page, the URL is changed automatically to reflect your actual page title. Lock blocks: If you set this option to “Yes”, you cannot remove blocks from the page. You can still add new blocks, re-arrange them, but cannot delete any blocks. This is to prevent accidental deletion of blocks from a page, in particular if it is a template page that people copied into their own account. Portfolio authors can remove the lock from the blocks through this setting if they wish and delete blocks once they copied the page to their own portfolio area. Name display format: Choose how you want your name to appear on the page to others. Anonymise: If the site administrator allowed anonymous pages, you can choose this option here. Instead of your (display) name, “Author’s name hidden” will be displayed to everyone. Administrators and staff can still see your real name. Layout: Click the icon to display all layout options. You can change the layout to decide the overall distributon of your blocks on the page. Skins: Click the icon to select a skin for your page. Click the Save button to save your changes and to continue to the Edit content part. when you are on the Pages overview page. Click the Edit this page button when you are on the actual page. 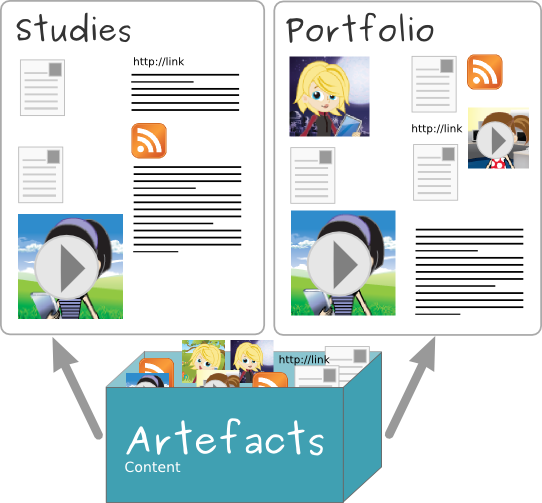 You find more information on how to edit artefacts on a portfolio page in the Edit content part. If the site administrator activated clean URLs, your portfolio pages have human-readable URLs which you can change to a certain extend. When you are in the page edit mode, click the Settings button. The original, internal Mahara URL, e.g. https://mahara-university.org/view/view.php?id=789 will still work. If you want to organize your portfolio into multiple pages so as to find individual sections more easily, you can create a collection that holds multiple pages. Collection name: Provide a title for your collection. 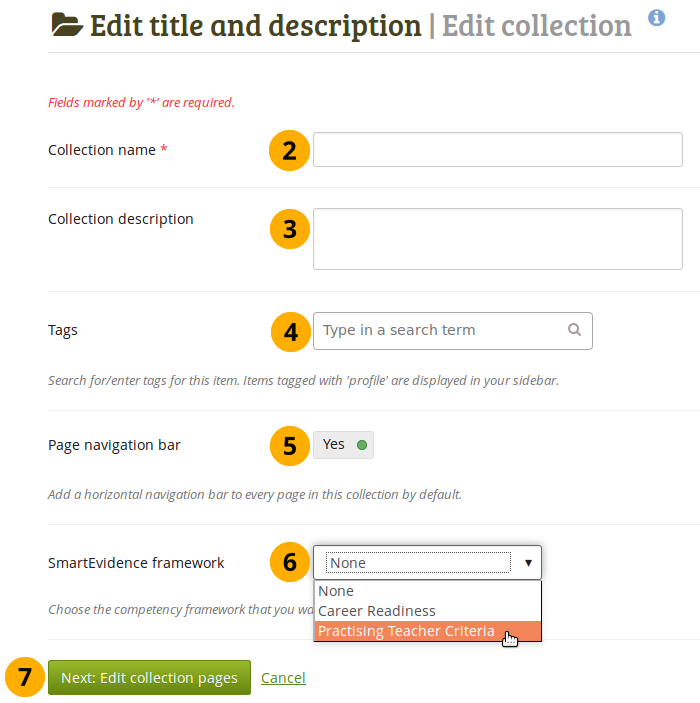 Collection description: Optionally, you can write a short description about your collection. You do not have a visual editor, but just a plain text box. Tags: Enter tags to find your collection more easily at a later stage. You can choose from your existing tags by starting to type a letter and then selecting the tag you want to use. You can also type a new tag, and it is added to your list of tags. Page navigation bar: Choose whether you wish to display a tabbed navigation or not. If you choose not to, you will have to include the navigation block for you to go from one page to the next on the individual pages that belong to this collection. SmartEvidence framework: Select the framework that you want to associate with your collection. You can change the collection as long as you have not put an annotation onto a page within the collection. This functionality is available if your institution administrator allowed the use of SmartEvidence. Click the Next: Edit collection pages button or click Cancel if you want to abort adding your collection. In the next step after you have created your collection, you choose which portfolio pages you wish to include in this collection. You see all the potential pages that you can use. If you had already placed a page into another collection, it is not shown here. Put a check mark next to each page that you wish to include in your collection. Alternatively, you can click the All link to add all pages available to the collection or the None link to revert your selection. Click the Add pages button to add the pages to your collection. If you do not wish to click all pages, you can also drag and drop them into the collection by clicking their title and dragging them to the area Pages already in collection. A dotted line shows you where you can drag your page so you can already drag the pages into the collection in the order that you prefer. Click the Done button to finish this step. Once you have added your pages to your collection. You can move them around or remove them. Use the Move up and Move down buttons to arrange your pages in a different order. Alternatively, you can drag and drop the pages within the list. Click the Remove icon to take a page out of a collection. The page itself is not deleted. Put a check mark next to each page that you wish to include in your collection in addition to the ones already in it. Click the Add pages button to add the pages to your collection and then move them around with the Move up and Move down buttons. 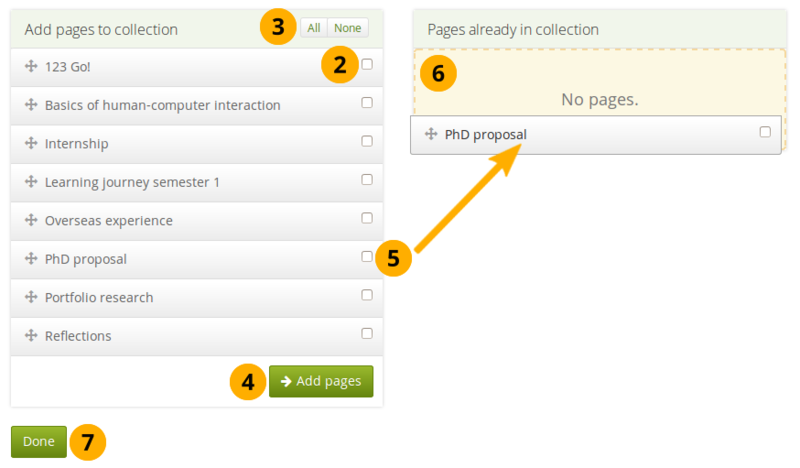 Alternatively, you can drag and drop the pages to the position where you would like to have them in the list. When you add pages to your collection that have different access permissions than the collection has, the page’s access permissions get added to the collection and the page is available under the same access permissions as the entire collection because it is part of the collection. If there is a change in access permissions, a warning will be displayed so that you are informed that changes have taken place. View your collection by clicking on the collection title or any page that is part of your collection. On a mobile device, you can swipe left and right to navigate through a collection when it has the page navigation bar. Drop-down menu: Select the page to which you want to jump within the collection. to navigate to the previous page. to navigate to the next page. Title of the page you are currently viewing. Clicking the Copy button when you view a portfolio and are allowed to copy it. You can copy a page or collection directly when you view it by clicking the Copy button when you see it. The button is displayed on your own pages and collections as well as on pages and collections owned by others when you have the permission to copy them. 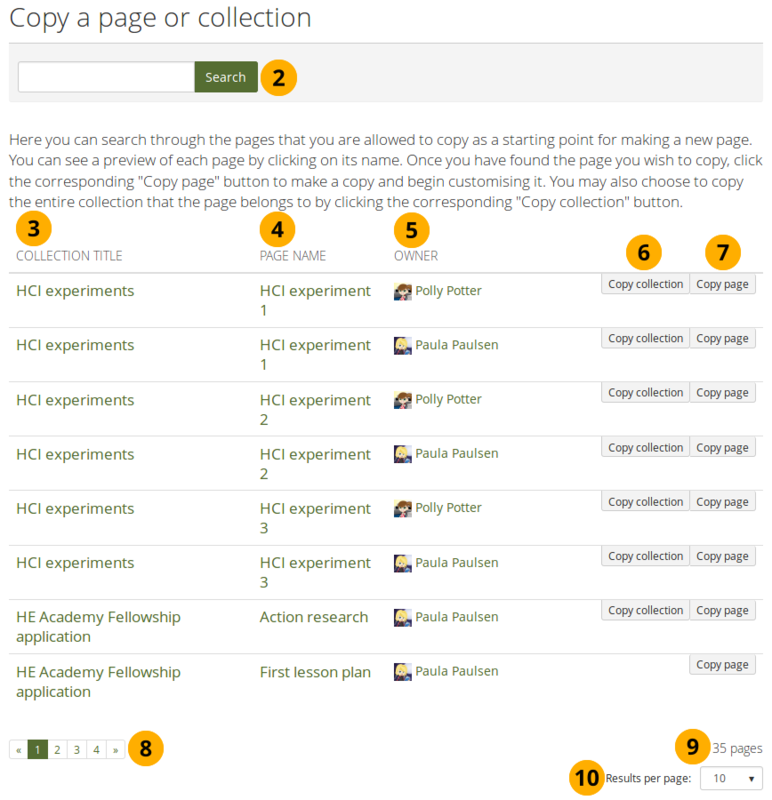 Click the Copy button when you want to copy a page or collection that you can duplicate. Or just the page that you can see currently by clicking the Page button. Edit the page or collection as you would do any other. When you allow copying on public portfolios or portfolios shared via a secret URL, people who are not logged into Mahara can download the portfolio as a Leap2A export. You can duplicate your own pages or pages of other users if they allowed you to do that. Search: If there are many pages or collections from which you can choose, search here for a keyword in the page or collection title or for the name of the page owner. Collection title: Click on the title of a collection to preview it before copying it. Results are listed alphabetically according to their collection title. Page name: Click on the title of the page to see a preview of it before you copy it. Owner: Click on the name of the owner to view a larger profile picture and the self description if the owner provided one or to see information about a group it that is the owner. Click the Copy collection button to copy an entire collection with multiple pages into your portfolio. All pages within this collection are copied. You can navigate through the list of pages and collections to which you have access. You see the total number of pages you can copy. Results per page: Use this drop-down menu to change how many results you want to see per result page. If your copied pages and collections start with “Copy of”, the site administrator decided to have copies renamed. You can view a page to check what it looks like when somebody else sees it. Go to the Pages and collections overview page and click on the title of a page. Title of the portfolio page. Author of the portfolio page. Tags which you provided for your page. is only visible if you are the page owner or belong to a group of users who can make changes to the page if it is in a group, institution or site level. is visible when you can copy the page or collection that you are viewing. You see it on your own pages as well as pages of others. to reach lesser used functionality on a page. Click the Print link to open the print dialogue. Using this print functionality, your portfolio pages are printed in the current layout, with collapsed blocks or artefacts uncollapsed so you can see their content easily. Note: Links are not yet active and linked files or embedded media are not accessible. Click the Delete link to delete your page. Click the Timeline link to view previous versions of your portfolio. This icon is only visible when you saved your page to your timeline. 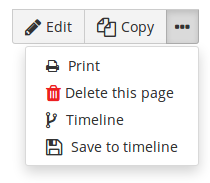 Click the Save to timeline link when you want to save a particular state of your page to your timeline so you can go back to it later and compare it to your current state. The comparison would be manual. Add or remove a page from your watchlist: Click the Add page to watchlist link if you want to be informed when changes are made to the page. When you make changes to the page or a block on the page, a notification is triggered and sent to anyone who is watching the page. 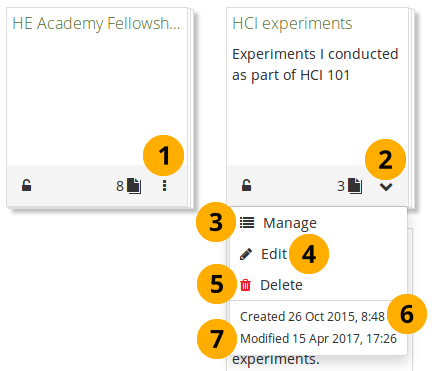 This is also the case when you add a new journal entry to a journal that is displayed on your page even when you do not add the entry via the page. If you no longer wish to receive these notifications, remove the page from your watchlist by clicking the link Remove page from watchlist. Report objectionable content for this page: If a page contains offensive artefacts, you can report them to the administrator and provide an explanation why you think the content is offensive. Once you have reported the material, you see Objectionable material reported instead of Report objectionable material. Click the Timeline link if you want to view an older version of the page. The artefacts that you placed in the page. Click the Add a comment link Add comment to be taken to the Details page for this artefact to leave a comment. Click the Details icon Details to be taken to the Details page for this artefact if there is one. 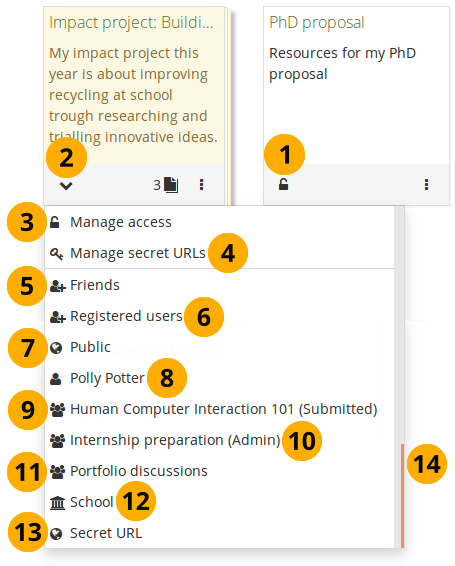 If you belong to a group which allows the submission of pages for feedback / assessment, you see the group displayed here or can choose it from the drop-down menu and can submit your page directly from here. For more information see the section on feedback for assessment. Profile picture and name of the commentator that are linked to the profile page. The creation date of the comment and potentially the last update date and time of the comment. A note if the comment is private only to the commentator and the portfolio page author. For more information on giving and receiving comments, please see section Feedback. The total number of comments is displayed. You and others can use the Add comment section to leave comments on the page. Please refer to the section on making comments to see how that can be done. Display the last update date and time of the page. View how many times your page was accessed. Please refer to the section on sharing your pages and collections for further information. You can delete a portfolio at any time unless it has been submitted for feedback. When you delete a page, text blocks and external content blocks are completely deleted. You cannot recover them. There is no revision history. All other artefacts are not deleted because they reside in your Content area. When you delete a collection, the pages and artefacts within it are not deleted. when you view your page directly. 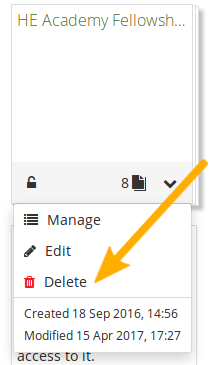 If you want to delete an entire collection, you can do so on Main menu → Create → Pages and collections by clicking the More options icon and then the Delete icon . When you attempt to delete a page or collection, you get the chance to export the portfolio first so that you can make an archive. If your page is part of a collection, the warning message also contains the title and a link to the collection for you to check whether you really want to delete the page and thus make changes to your collection. The title of the portfolio you are about to delete is displayed so you can double-check it is the correct one. An explicit warning about the deleting of the portfolio is displayed. Deletion cannot be undone. If you delete a page that is part of a collection, the collection is linked so you can view your collection and double-check deleting of the page is OK. If you want to continue deleting your portfolio, you may want to export it first so you have a copy in case you do need it later again. Click the export link to be taken to the options for the export. We recommend you export your portfolio in both HTML and Leap2A formats so that you can view them without the need of Mahara (HTML) or can import them back into the same or another Mahara instance or another portfolio software that supports the Leap2A format. Click the Yes button if you want to continue with the portfolio deletion or the No button if you want to keep it. Portfolios often show progress over time. However, what did a particular portfolio page look like at the start of the development process, a month ago or two days ago? The timeline makes those changes over time visible and allows the viewer to go back in time and look at an old version of the portfolio page. Versions are not saved to the timeline automatically so as not to overload it with tiny changes in rapid succession. You can decide when you want to save a version of your portfolio to your timeline. After you clicked the Timeline link on a page that has a timeline, you can see the page title. 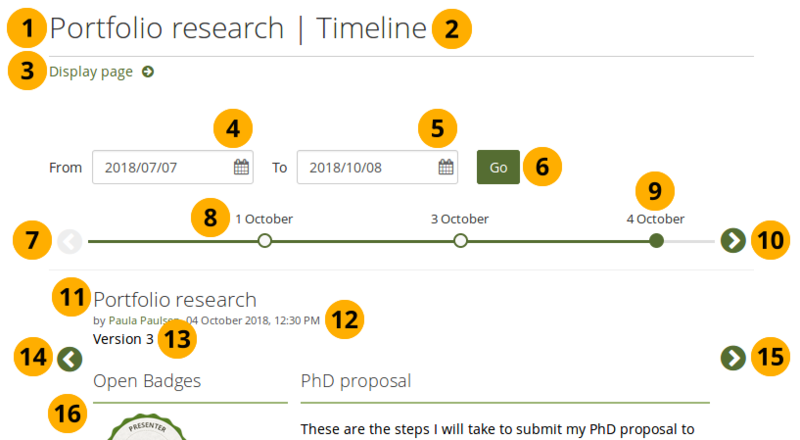 The word “Timeline” indicates that you are in the timeline view of the page. You can always return to the live view of the page by clicking the Display page link. From: Choose a starting date for the first version that you want to see. To: Choose an end date. The default date is the one is tomorrow’s date so that any version saved to the timeline today are still displayed. If there is no previous version, the Previous version button is greyed out . The dates for which timeline versions are available. The date of the active version that you are viewing is highlighted. Click the Next version button to scroll to later versions of the page. The page title is shown. The date and time when the version was saved is displayed. The version number is shown. Click the Go to the previous version button to go to the previous version of the portfolio. Click the Go to the next version button to advance to the next version. The content of the page is displayed as it appeared in that version.